It can be exciting to find a wild bird's nest or even the discarded shells from a recent hatching, but without care, it is very easy to misidentify eggs. Fortunately, with the appropriate clues and attention to detail, any birder can learn to identify bird eggs successfully. Birders are naturally curious to identify the birds they see, and identifying bird eggs is part of that curiosity. For birdhouse landlords, identifying eggs can help them understand which birds prefer their houses, and they can adjust the foods they offer and how bird-friendly their yard is to better suit each feathered family. Knowing which eggs are which can also help identify invasive birds that may not be as welcome, and can help note where brood parasites are active. Breeding bird surveys can always use volunteers who are familiar with egg identification as well, and the data from those surveys helps promote more effective conservation to protect all birds and their families. Size: Comparing the eggs to similar objects can help give an impression of size. Is the egg as small as a jelly bean, as large as a golf ball, or just the size of a finger joint? How does it compare to adjacent leaves or other nearby items? Shape: Eggs come in many different shapes. Is the egg round, oval-shaped, or pointed on one end? How thick or narrow is the egg? Is the shape very subtle or very exaggerated? Color: Different bird species lay different colors of eggs, ranging from pale and bland to bold, bright colors. What is the overall base color of the egg? How intense is the color? Are all eggs in the brood the same shade or is there some variation? Markings: While some eggs are plain, others have distinct markings. Are the mystery eggs spotted, speckled, or splotched? What color are the markings? Are they evenly spread over the eggshell or are they concentrated in a band or on one end? Note that eggs can be stained by nesting material, so be sure any extra colors are really part of the egg. Finish: The finish and texture of the eggshell can help properly identify eggs. Is the shell shiny and glossy or a flat matte finish? Is there any texture to the eggshell, such as dimples, ridges, or pebbling? Quantity: Some birds only lay one or two eggs, while others may have much larger broods or could participate in egg dumping with several dozen eggs in one nest. Noting the number of eggs in a brood can be a clue to identification, but bear in mind that the brood may not be complete when the eggs are seen. Nest Design: There are many different types of bird nests. Noting how the nest is constructed as well as its size, overall shape, and nesting materials can help positively identify the eggs it contains. Nest Location: Where a nest is positioned can be a valuable clue about what bird built it and laid the eggs. Is the nest in a cavity or out in the open? Is it on the ground, under a bush, or low in a tree? Is it positioned very high in a tree or on the side of a cliff? Is the nest attached to a structure, such as a house, bridge, or nesting platform? 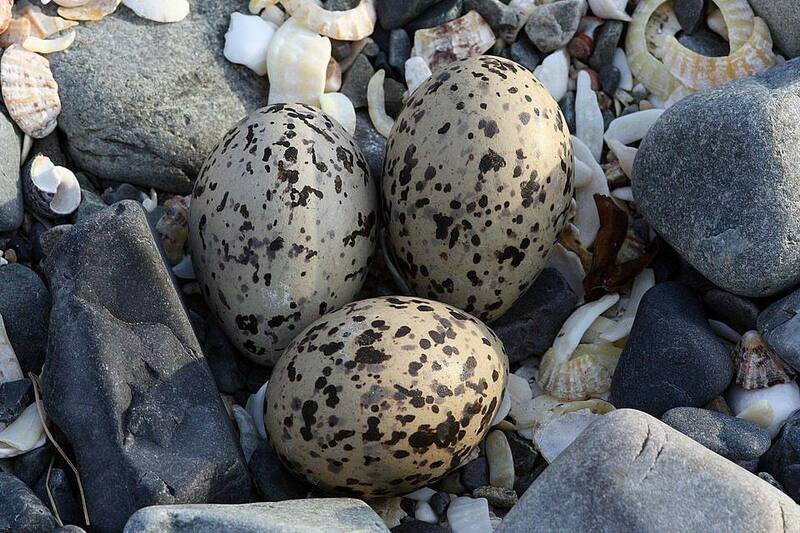 Habitat: Just as birds can be identified by habitat, so can bird eggs. Birds need a rich habitat that meets their needs in order to raise their young. While vagrant birds may appear well outside their specific range in different habitats during migration, birds do not typically breed outside their preferred habitats. Incubation Period: If a birder has the opportunity to observe a nest until the eggs hatch, the length of that incubation period can be a clue toward the hatchlings' species. A difference of just a day or two could indicate a different species, however, so if birders are not aware of exactly when the eggs were laid, it can be hard to determine the full incubation period. To properly identify bird eggs, birders should use several as many clues as possible to draw their conclusions. Once the eggs hatch, it can be rewarding to watch hatchlings grow and mature while they verify that identity. When watching bird eggs, it is important that birders do not let the desire to identify those eggs jeopardize the health and safety of either the parent birds or their unhatched chicks. Never pick up or handle wild bird eggs. Scents and oils from hands can contaminate the eggs and may harm the young birds or attract predators to the nest. Avoid stressing adult birds when they are brooding the eggs or adjusting their nests. If the adults become too stressed, they may abandon the nest completely. Keep a safe distance, using binoculars with high magnification or cameras with zoom lenses only to examine the eggs. If the nest is out of reach and it is critical to see the eggs, use a long-handled mirror if possible. Always minimize the amount of time in contact with the nest to minimize stress to the birds. Identifying bird eggs can be a challenge, but it is a great way to sharpen one's birding skills and learn even more about these fascinating creatures. Practice identifying bird nests and eggs with this photo gallery!